This past week has been one to remember for sure. It was the first week of my practicum at Production Road working under the owner of Chairman Ting Industries Inc., Carson Ting. And wow has it ever been awesome! I was welcomed so warmly on my first day on Monday, Feb 25, 2019. Right away my nerves went away and I felt like it was the right place for me to grow and learn as an illustrator and designer. I met the lovely Aiken, studio manager and just purely talented at everything super star (she’s also my buddy! - and long lost sister?) Annie - who is a surface designer and has a shop set up in the front portion of the studio (I already know I am going to loose all my money here buying her merch) and her husband Hubert Kang, an crazy talented photographer and producer. They were all so nice and excited to have me, and I was so excited to be there. I added my business cards to the creator tray! After settling in with Aiken and going over my list of tasks for throughout the 6-7 weeks we got started on a bunch of projects that have gone on throughout the week. Some were helping Carson while he was away on big ongoing projects, and some were like putting together promo packaging for Hubert’s future clients. I was assigned my first client, Frank, the owner of North Side Sign (A print shop) which installs large scale prints, hoardings, and just about everything under the sun. I got to have a client meeting with him and take point of the project under Aiken’s supervision. It was nerve wracking when he randomly showed up at the office and luckily I was all prepared to meet with him! It was a little scary, having only done a few website design projects to being thrown right into one but I enjoyed the challenge and it has given me the opportunity to expand my skillset as an illustrator and logo designer. Now when I design a logo for a client, if they ask for a website as well I am able to offer that! 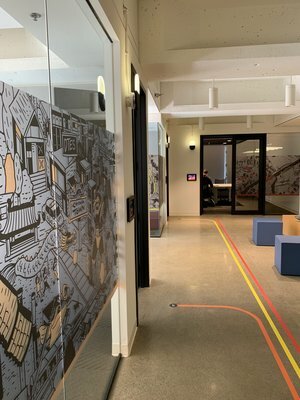 I also got to work on quite a few projects for clients of Huberts and Carson’s and I was included in all the emails and back and forth communication to see how the decision making and progress of the projects were coming along. It felt great to be included in a big project and see how committed everyone was to the client and delivering a great end project. Throughout the week I became more comfortable and Aiken and I realized how much we had in common, many laughs were exchanged, I bought a heating pad off Amazon which turned out to be life changing, I brought in butter mochi for the hard workers one morning and Carson took us all out for an awesome lunch at Guu. It was so nice being able to work in close quarters to other artists where you could tilt your head and ask a question or say “What do you think about this?” And go off on a brainstorm frenzy with three crazy illustrators. Such a good week, looking forward to the next one. What a crazy week that was. I loved it! 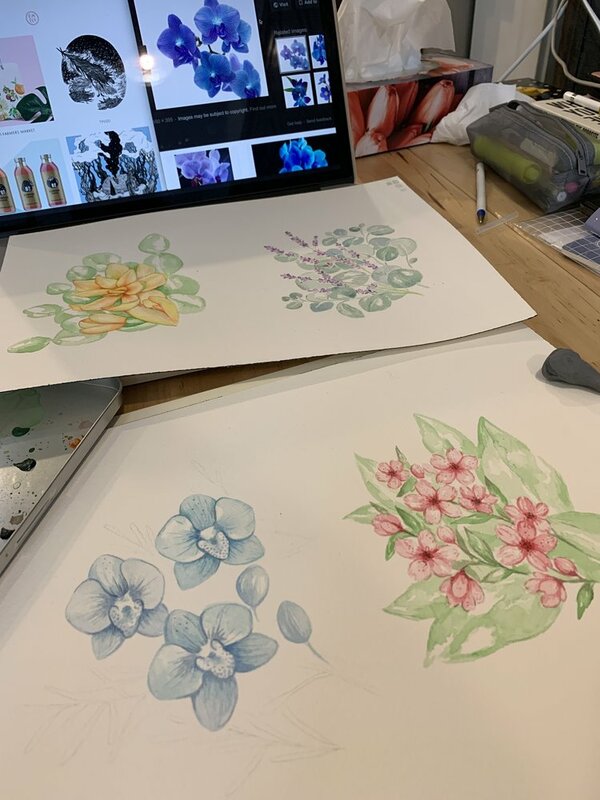 Other than that project taking up most of the week I was given some time to work on my portfolio pieces in studio so I could get feedback on how to make them look better. Carson mentioned he wanted me to give him a few pieces for his blog so the pressure is on to finish them all up! Heres a pretty mock up I made.. I also helped a bit on some drawing of a mural for one of Carson’s clients. He taught me his process of how he makes his digital murals and how they are able to be blown to such a big size. On Friday Annie came back from Hawaii as well! She is the surface and pattern designer who’s work is displayed at the front of the shop. She had an interview planned that day from some people at Spoonflower - a platform that supports textile designers and lets them create their own patterned products. It was really interesting getting to meet them and seeing them set up everything for the interview. I enjoyed listening in on the questions that they asked her because most of them are questions I wanted to ask her too! I feel like I am slowly learning of all the different ways that my illustration can be applied, and that each has its own style of life with it depending on which avenue I take. With freelance client based projects it’s more of a fast pace lifestyle, with lots of deadlines and lots of critiques and networking and beyond. Maybe it’s too crazy for me? I’ve always pictured that I want to end up in a little apartment in Kauai, but doing what? The nice thing about freelance illustration is that you can do it from anywhere and your clients can be half way around the world from you! And on the other side, like Lemonni (Annie’s business) she leads a slower pace lifestyle. Making her own products and selling her designs directly or selling them online works really well for her. First thing first though is I’ve decided I’m going to work a design position in a company or agency for a while until I can pick myself up with freelance work and have enough to support myself like Carson does. Feeling so inspired. After the interview Carson treated us all to some very delicious ramen at a nearby restaurant. The location where we work is surrounded by delicious restaurants and it’s extremely tempting!!! It was nice to chat about things other than work - mostly about the food in Hawaii and where were all dreaming of traveling in the future. The weeks seem to be going by incredibly fast.. I cant believe week 3 is already over! This week was aimed on wrapping up Franks website, owner of North Side Sign and starting a new and exciting project. I had never designed a website for anyone before, I have had clients ask if I am able to and now I can say yes! Im really learning how to use square space and it will look great on my resume. Frank had already hired quite a few people to try and help him with his site and I was just glad that I could have the opportunity to fix it and give him ease of mind. At the end of the second week Carson and I were brainstorming on a fun project that would benefit my portfolio and be something that would act as a networking tool for creatives. We landed on a Zine. A zine is a small magazine and we started brainstorming for the name and concept. Aiken put together a deck and also the layout of the index. I started on ideation for the cover and am still in the process of sketches while also fitting in my lunch break portfolio projects like a perfume line I am designing! Projects come and go, quite quickly I’m learning. Most of my clients were easy going and let me have creative freedom. I’m learning that theres clients out there who have a very specific vision and will drop you if you cannot deliver that vision. My eyes were opened when I was struggling trying to price something for a client of mine and it was giving me a lot of stress. It has been so great to have a mentor to ask questions to and who you can trust, and his words were really helpful. I have been taking client critiques too personally, I have to grow tougher skin if I want to be able to make it into the freelance industry! Clients come and go! I’ve also started to notice Carson’s work everywhere I go now.. amazing! I’ve been keeping his constant advice in mind and it helped me end a tough project with a client on a good note. Talking about clients coming and going, Carson gets proposals for projects all the time and some that he just doesn’t have the time to take on - so he was able to hand a fun one off to Aiken and I. The project is to create album cover art for a band called American Television. Most of my Friday was spent sketching out concepts. This week was a little rough, I ended up missing two days of my practicum because I was very sick :( Little did I know half the people at other agencies were also sick and quite a few other practicum students were sick as well. I was very sad to miss two days of work but luckily I was able to make up my time working at home between naps and popping cough drops like candies. I made sure to be well enough (cough cough) to make it into work on Friday because Friday was my practicum takeover day on our grad Instagram page @ideanineteen! I had no photos of me to post so Carson pulled out his camera and snapped a few awesome pics in-between blowing my nose and he somehow got some good ones! (I tried not to look like death as I was for sure feeling it) here are a few.. The front of the studio is a little boutique full of Annie’s, Aiken’s and Carson’s products. The amount of times I boil the kettle and forget is incredible. Sometimes I go to the storefront to brain storm! The week continued steadily with working on our rough sketch for the album cover and sending that in to client for approval. We were able to send it in early and get our critique that will be implemented on Monday. Our concept for the album cover is very exciting and as a hint… it will include a lot of paper and exacto blades..! I also asked for my first deposit for a job and am learning how to better handle a freelance client, it has been so helpful having Aiken there as she is the best with this stuff! Everything in the studio has been so much fun, so many brain storm sessions and awesome lunch breaks too. The team treated me on Thursday to a birthday lunch out to my first full Korean meal and it was amazing! It was so sweet and nice of them to think of me. It has been a great week and looking forward to the next one (sickness free!) Now time to go enjoy my birthday! The weeks are going by so fast.. too fast! I’ve also been totally getting spoiled at work and lets just say that many jokes were made about us all gaining a LOT of weight. One day Hubert brought in a box of cookies and brownies and sweets then the next day Aiken brought in another box of sweets and then the next day Carson brought in a whole Lindt chocolate bread cake! It was so much, I didn’t know I would be having cookies for breakfast every morning and I am not unhappy about it. On top of that Hubert and Amy, owner of Kindred & Scout Productions thanked me for helping on their project for the Fairmont with a sweet box of chocolates and a nice card. No complaints here! Everything has been moving so fast, even projects the team has been working on are already out in the public. I saw a project I worked on already in the movie theatre for the aquarium! 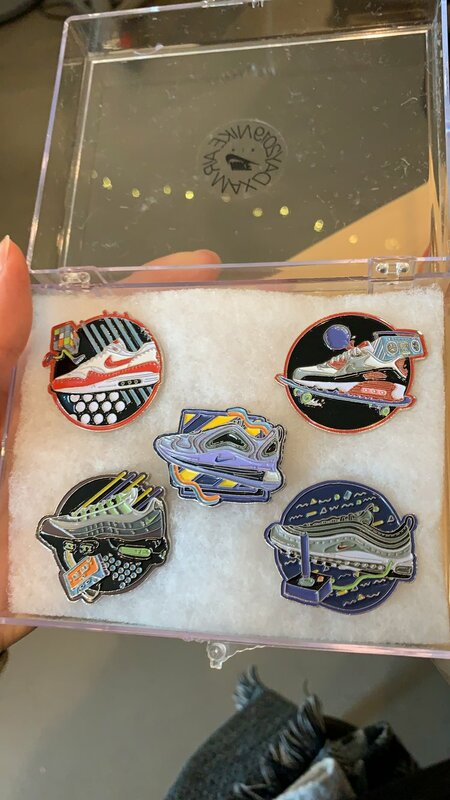 And Carson’s pin line he designed for Nike was released and they express shipped 3 sets for Carson, Aiken and I so now I have an absolutely dope set of pins. Had to snag a selfie with Carson’s wall Vinyl! Aiken working her photography magic on capturing the illustration’s of Carsons at Kabam in Vancouver. After the tour was over and I very slowly walked through some low shutter speed photos for Carson for his website we headed over to 1000 Parker Street. If you don’t know what that is, check it out during the Art Crawl! It is an amazing building that hosts many talented artists in studios there, including the very talented Carla Tak. 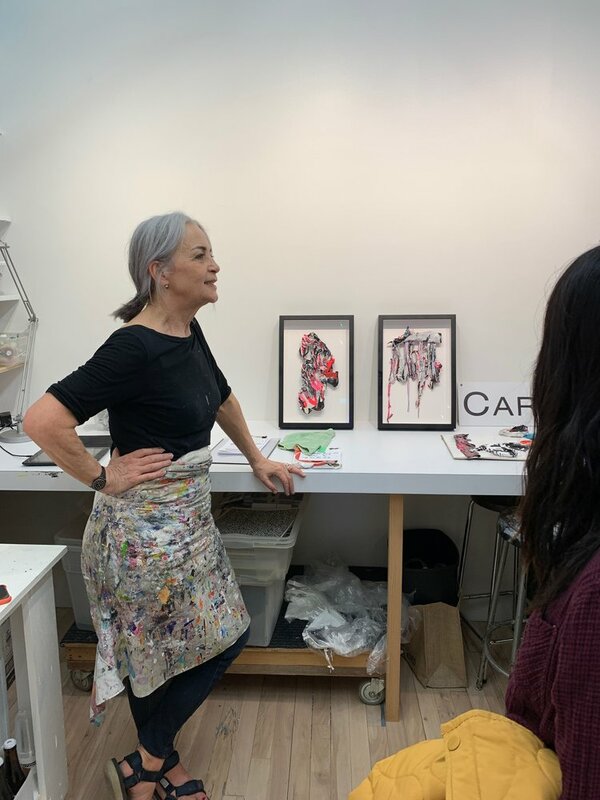 We dropped in on her studio and she talked about some of the new art she is producing and how she is playing with dried art from off of of her tarps as a new medium. She also told Aiken and I a bit about her life and her story of how she became an artist at age 50 and how you should always follow your passion. It was very inspiring and lovely to meet her. We then moved on to another studio called Tangible Interaction, where we got to play with their digital graffiti wall, see their OH! Science world globe project, a model of their marshmallow cloud, mini halo swarm and more. The final piece of artwork Carson drew for the Tangible photoshoot. 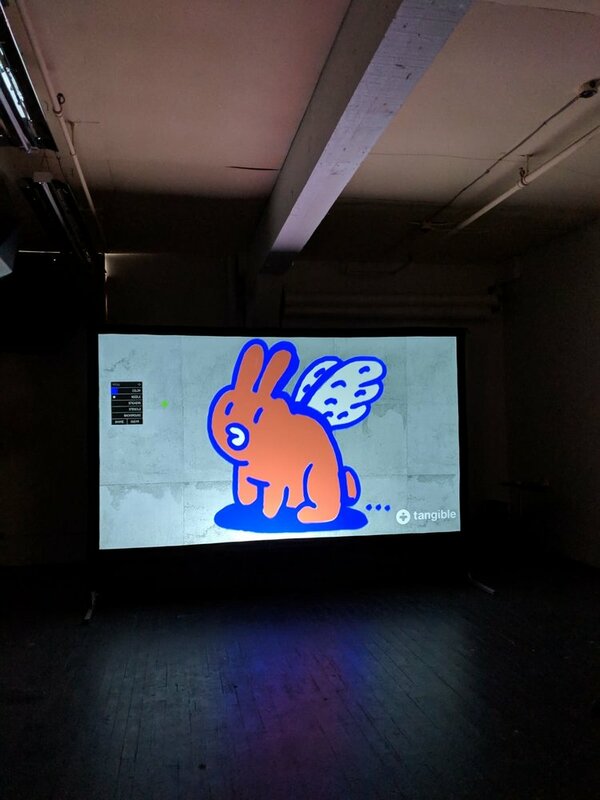 I assisted for Carson in filling in his drawing on the Graffiti wall with electronic paint cans (don’t ask me how they did that I still don’t understand) but it was super cool. Carla Tak uses layering techniques, paint buckets, etc! I think I need one of these in my dream house! Carla Tak, Aiken Lao, Me, and Carson Ting. Her artwork is amazing! The week ended with that awesome field trip and I cant wait to continue production for American Television next week! I only have one more day to complete until my hours are done! 240 hours have gone by so fast its unbelievable. The week started on a fluffy note when Carson brought in his adorable 15 year old blind bunny Bella and we bonded big time. He had to drop Bella off at the bunny care taker because he is going on a little trip to Las Vegas with his wife and adorable girl Audrey. Part of my job here is to cuddle cute animals and its the best. New best friend? Should I get a bunny? So cute. We also had the opportunity to get our hands dirty! Aiken and I were given the task of going to Cossette to repair a piece that Carson had done for them that had reacted to its environment and cracked. We came prepped with food filler and paint, spending the morning in the accounting department filling, sanding and painting over the cracks in the wood to make the piece look new again! Carson then treated us AGAIN for our hard work with a nice lunch and we ate it thinking of him having a blast in Las Vegas! Crazy guy escaping from his intern for the last couple days! 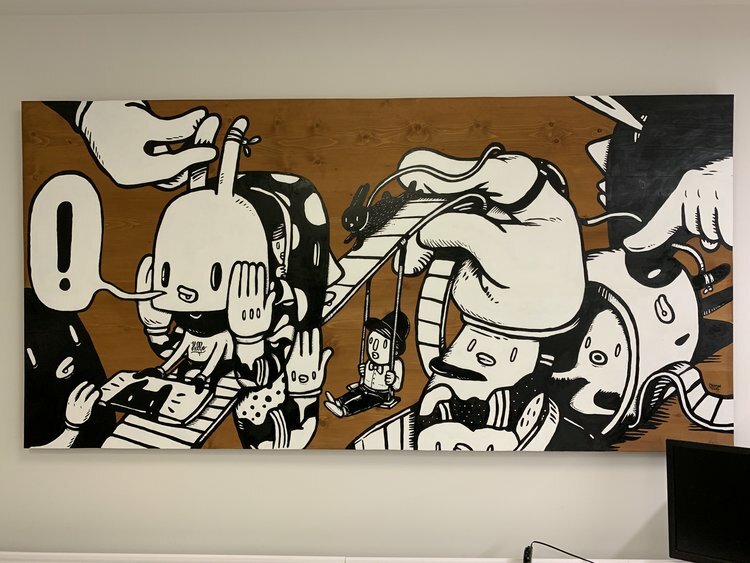 Luckily Its not going to be the last time I work with him as I will be coming in after my grad show to finish up some projects and then also later in the summer I will be helping out on some murals! Sneak peak of part of the building process! Lastly from our brainstorming session of our ideas that we gathered for NAC competition we did a peer review with Hubert and Annie and had a great critique session where they brought up some points and ideas that brought us in another direction for our project. Getting more perspectives has allowed the project to become even stronger conceptually. I then drew out our ideas in refined form and we sent that off to Carson who’s still working even on vacation for feedback. My weekend is going to be spent prepping for my grad show and finding the perfect outfit to wear for the big event. The Grad Show event takes place at the Harbour Centre Lobby @ 6:00pm if you are able to join! Hope to see you there! For more on Emily including the final two weeks of her practicum story, see emilyroseartist.com. For more on Chairman Ting Industries Inc., see chairmanting.com. This experiential learning course takes place primarily off campus. Students work within a studio/agency environment or with a personal mentor in a capacity related to visual communication. Students undergo a placement interview and both parties work to strict contractual guidelines that guide behaviour and learning in a professional environment. Students provide written reflection and a final report on their work experience. James has over 20 years of experience in the web/interactive design and development, Internet marketing and social media industries, working primarily as a freelancer, consultant and instructor, but also as a subcontractor to small agencies. He has experience with a variety of clients in small business, government, institutional and not-for-profit sectors. James is also an instructor, lab supervisor and blog/social media coordinator at Capilano University's IDEA School of Design.